In Heathsville St. Stephen’s annual strawberry festival is one of the largest and most anticipated spring festivals in our area. This year’s event was no disappointment as beautiful clear weather set the stage for a fun filled day of food, shopping and fun. Attendees from far and wide amassed to explore the wares of local vendors and the season’s finest fruit in all of its forms. 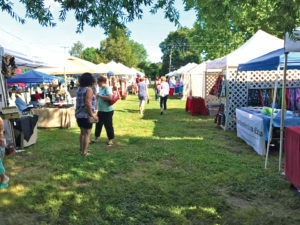 With nearly 100 vendors, this years market featured a wide variety of offerings, some of which included fine handmade jewelry, homemade soaps and bath products, handcrafted wooden items, plants, baked goods, and much more. Non-profit and other community organizations such as the Native Plant Society, the Northumberland Association of Progressive Stewardship and the Smith Point Sea Rescue mixed in with the numerous artisans to offer up their knowledge and educate others about their causes. Food vendors offered tasty options ranging from hot dogs and hamburgers to crab balls and even Greek entrees. By far the most popular food of the day was the signature strawberry shortcake, which garnered a line that remained lengthy for a majority of the day. While patrons enjoyed their meals several local musicians and bands took their tunes to the stage. With a variety of music ranging from classic southern rock to traditional gospel, their was a little something for everyone. To see all residential Heathsville properties as of 6/5/2017 for sale in the Northern Neck click here. Call Northern Neck Realtor, Ken Smith, for your real estate needs in the Northern Neck. Ken is a full service realtor specializing in waterfront properties. To learn more about Ken please visit, https://northernneckrealestatesales.com/northern-neck-realtor-ken-smith/. If you are planning on buying in the Northern Neck then you need a Buyer’s Agent and when you choose Ken Smith you get a Northern Neck native with over 40 years of knowledge working the waters of the Northern Neck.